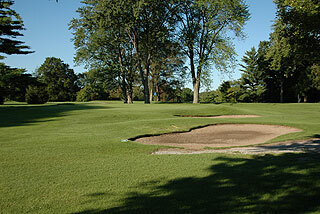 Black River Country Club near Port Huron (5 minutes from the I-94 and I-69 expressways) is a nationally ranked USGA championship course which opened to the public in 2001. 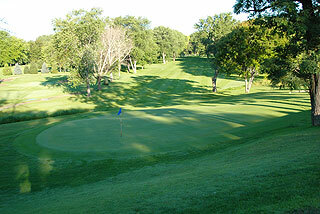 Originally designed as a nine-hole course in 1926, Black River was redesigned and expanded into a private 18-hole facility in 1956. In the next half a century, this private club hosted many prestigious national amateur and professional events including, most recently, the 1994 and 1995 Buick Open Qualifier and State and US Amateur Qualifiers. 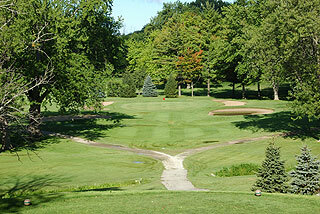 It will be host to the Michigan Publinxer Amateur events next season. 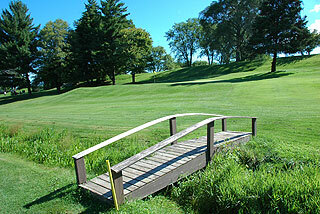 Legends Byron Nelson, Ben Hogan and Jimmy Demret have all played Black River. Rocco Mediate and Lee Jansen are said to have shot 64 and 65 here during their qualifying days for the Buick Open. With this rich history, we pegged Black River to be a mature, traditional track - and we were not disappointed. With a par 71, 6500 yard design, this course is playable to golfers of all levels. The whites measure 6250 and the front tees play at 5500. The layout features a gently rolling terrain, with flat lies resulting from your tee shots on most holes. 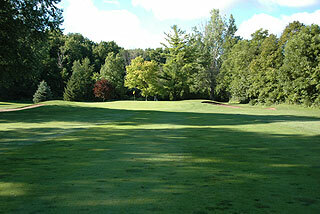 Very mature trees line the well-conditioned fairways, with a few strategically placed bunkers guarding the greens. This is not an easy round, particularly if you spray your tee shots - but you may find it easy to reach the greens in regulation if you hit to the appropriate spots on the fairways. The greens look rather easy - but don't be deceived. Study the pin placement and land your approach below the hole and on the correct side or your putt will be trickier than it seems. The opening holes are rather short par 4's, allowing you to get off to a good start. 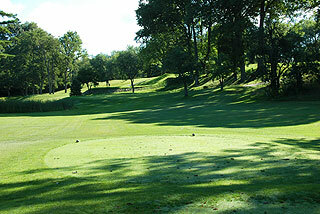 # 3 is a par 4 (par 5 for women) with a pretty tight fairway and an uphill approach to a exceedingly undulating green protected by a narrow creek and trees on the left. Two accurate shots will get you close enough to read the green and land your pitch on the correct tier and below the hole. A bird is possible but par is good on this # 1 handicap. Hole # 5 is a rather pretty and long par four, as are numbers 8 and 9 - all playing at around 400 yards. 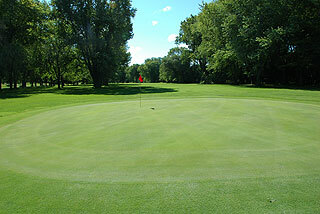 The two par threes on the front are of medium length and allow you an opportunity to keep your score down. The back opens with a very short dogleg left. There is much room to the right, which is a better play than trying to shorten the hole to the left. Pars are good scores on 11 and 12, which brings you to one of the signature holes on the course - the par three 13th It is an easy shot to the slightly uphill green - but your putt will break more than you realize on most pin placements. 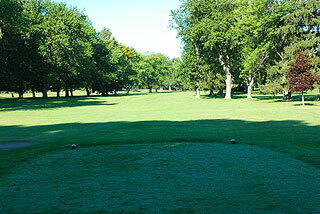 After a reasonable par 5, you are confronted with the number 2 handicap and the longest par 4 on the course. Sixteen and seventeen are very playable, preparing you for a strong finish on the long, uphill par 5 finishing hole. The last sequence of holes features a terrain which is a bit similar to the design of many of the holes at Oakland Hills Country Club - with rolling, tree-lined fairways leading to a downhill approach on 17 and an uphill approach on 18. We enjoyed our round thoroughly and appreciated the variety of shots required (I used all the clubs in my bag) and the consistency of the greens and overall conditioning. Black River is one of the best deals around - and well worth the drive from metro-Detroit. If you are looking for a secluded round on an unpretentious, traditional course - this is the place. The staff is friendly and courteous and eager to please.